← What are the Effects of Caffeine in Aging Adults? Stress is necessary in our lives to provide focus and motivation for solving a problem. However, when the body is exposed to stress over time, it can have negative health effects. Some of the most common include high blood pressure, anxiety, heart conditions, insomnia, poor memory and a weakened immune system. This is very true for elderly adults because they are more susceptible to the effects of stress over time. Compounded with the fact that many seniors are already facing diminished health due to illness, injury or chronic conditions. 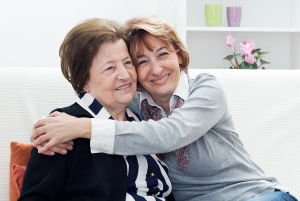 Family caregivers can help their elderly relatives deal with stress in their lives when they adopt these proven stress management tips for seniors. Researchers discovered that elderly adults with a strong social support network of friends, family members, elder carely assistants, therapist, doctor, clergy and more are less likely to get stress-related diseases. Being social actually slows down the release of those stress hormones that trigger physical responses in the body. A healthy body is better able to resist the effects of chronic stress. Exercise is possible for every elderly person and can include walking, water aerobics, seated exercises and tai chi. Studies show that exercise can lower the levels of stress hormones. Good nutrition is essential to keeping the body healthy enough to stand up to chronic stress without negative side effects. While family members can’t resolve every issue, there are many stress triggers that they can control. For example, if an elderly relative no longer feels safe or stable when taking a shower and getting dressed, family caregivers can hire an elderly care assistant to help. If elderly adults are worried about health issues, regular medical checkups can assuage their fears. Believe it or not, elderly adults that own a dog or a cat are more likely to describe themselves as less stressed. Walking or petting a dog and cuddling with a cat can improve a person’s mental health and wellness. If the aging adult can’t care for an animal on their own, they might be able to with help from family members and elderly care assistants. There are numerous ways that a person can slow down their body’s response to stress. Among the most effective are medication exercises. These can be any type of self-reflection exercises that incorporate breathing or other relaxation strategies. Some seniors turn to prayer or tuning into nature with similar stress-reduction effects. Anything that family caregivers can do to reduce unnecessary stress for their aging relative is doing a great service. Not only will the elderly adults have a better chance at an increased day-to-day enjoyment of their lives, but their health will not suffer from the effects of long-term stress. For Elderly Care Services in Collierville TN, please contact the caring staff at Personal Care Services MidSouth today! This entry was posted in Elderly Care Collierville TN, Personal Care Tips and tagged Elderly Care Collierville TN. Bookmark the permalink.